Really nice work. I certainly appreciate the time you take for the pictures and set-ups which will help me a lot. Hope you can take some pics of how you do numbers on that angle, I have a few ideas for a setup but would like to see yours. Bob, thanks for stopping by and the nice comments, yes I plan to post some pictures of the engraving operation. 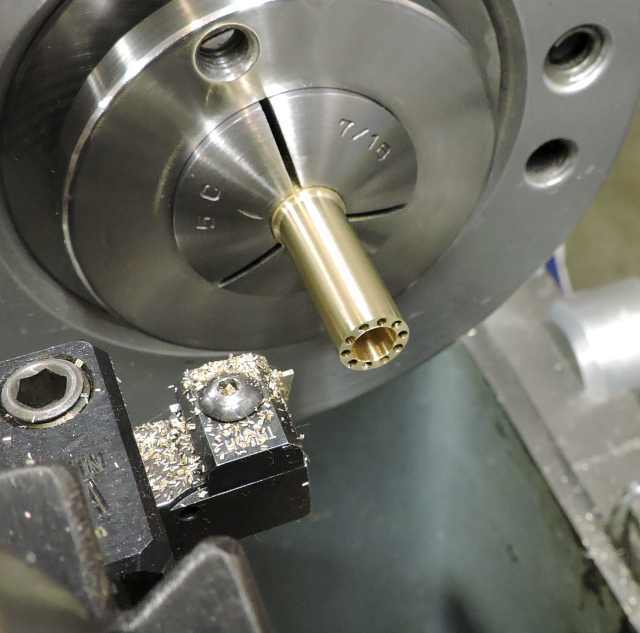 Next up is the machining of the nuts screws and thrust bearings. The nut castings like all the others need little to no fettling. I went over these with a fine file and then bead blasted them. 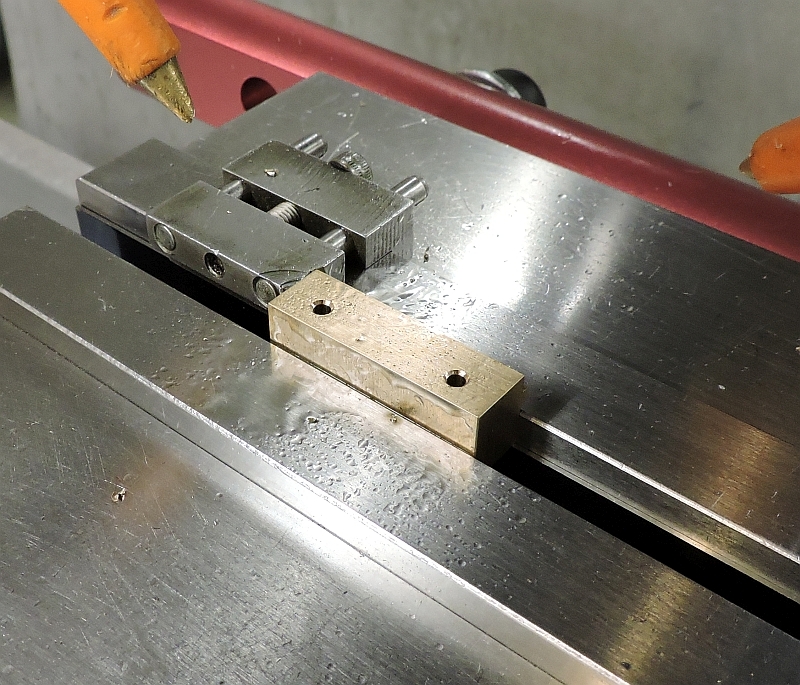 The nuts were put in the mill vise upside down and clamped on the boss. As you can see they were set on some cardboard strips from the back of a tablet to be used as packing. The nuts were indicated along their length and adjusted to run true. 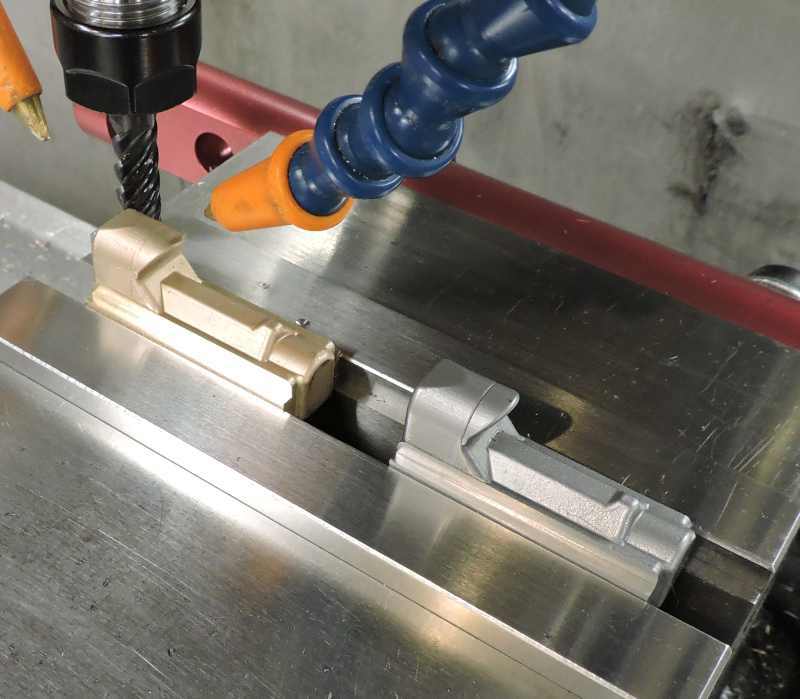 This will insure the as cast features are in alignment with the machined surfaces. 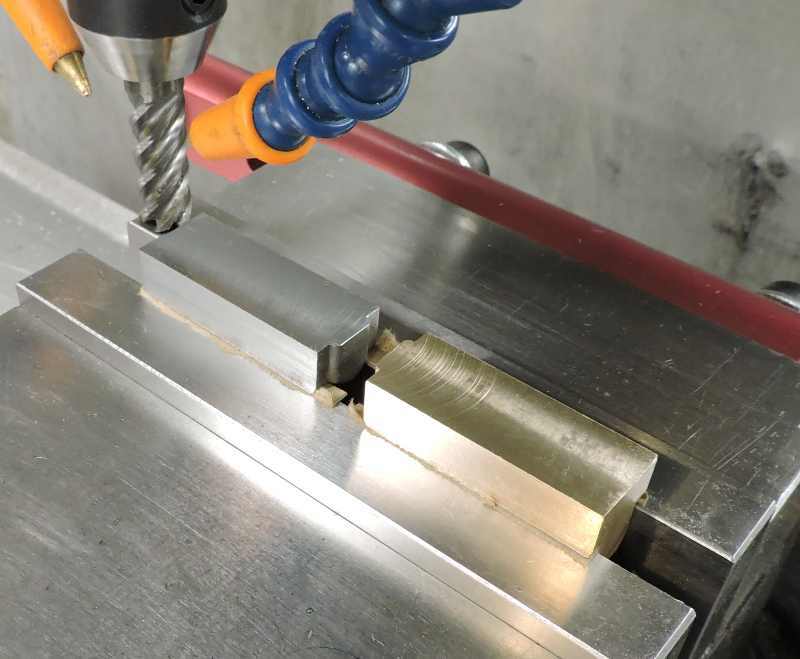 The bottom surface was faced to thickness and then the sides were machined to the proper width. The sides were machined to be symmetric to the boss. The nuts have been deburred and flipped over. 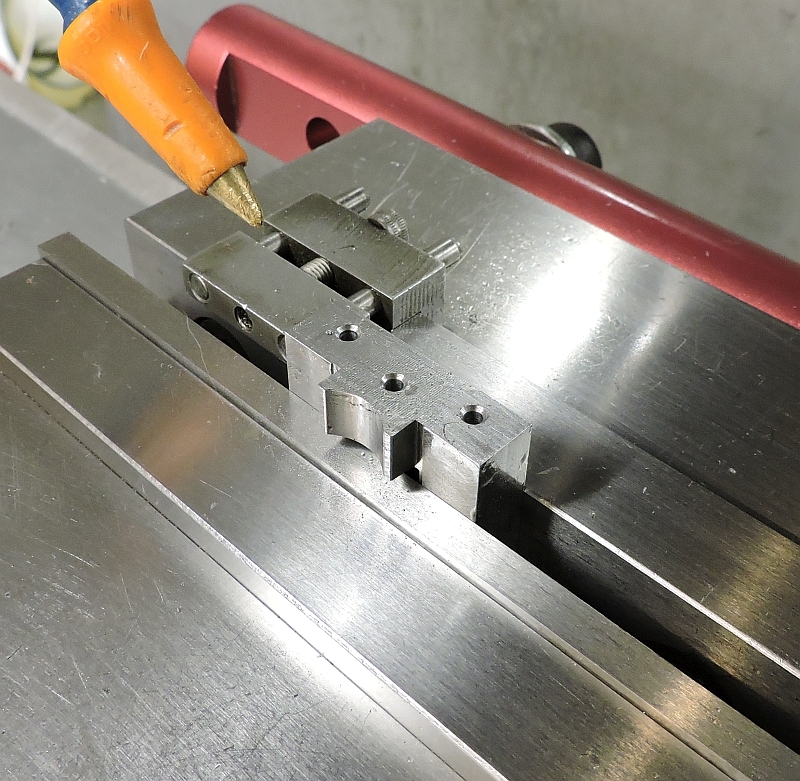 The rebates are machined on each side, once again making sure to keep them symmetric to the cast boss. In preparation for drilling a very light skim was taken across front face of the nut. After drilling the 1/4"-28 left hand thread is tapped. The tap had to be ground back to the square drive to have enough clearance. Using a small precision vise at the proper angle the large bevels were machined on the bottom of the nuts. The last operation on the nuts was to carefully remove the cast radius on the angled surface of the boss. This is for clearance needed by the ball segment. This should have been done before the large bevels were machined, then the nut could have simply been clamped on the sides and set at the proper angle. I didn’t realize at the time the this radius was going to need to be removed. The screws are machined form 1144 stress proof steel. 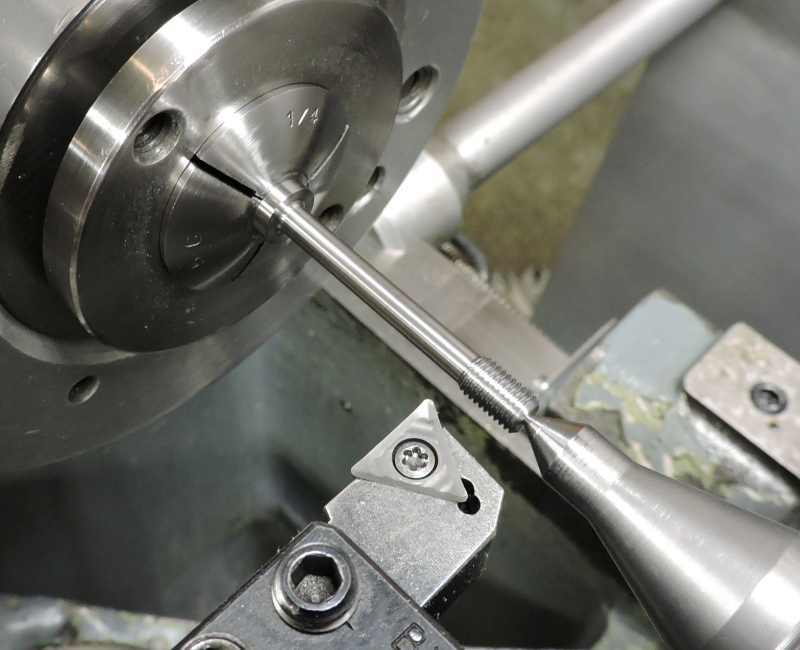 I had done the first operations on the CNC lathe at work, including the single pointed left and right hand threads. I must have been having fun, looks like I made a few extras. 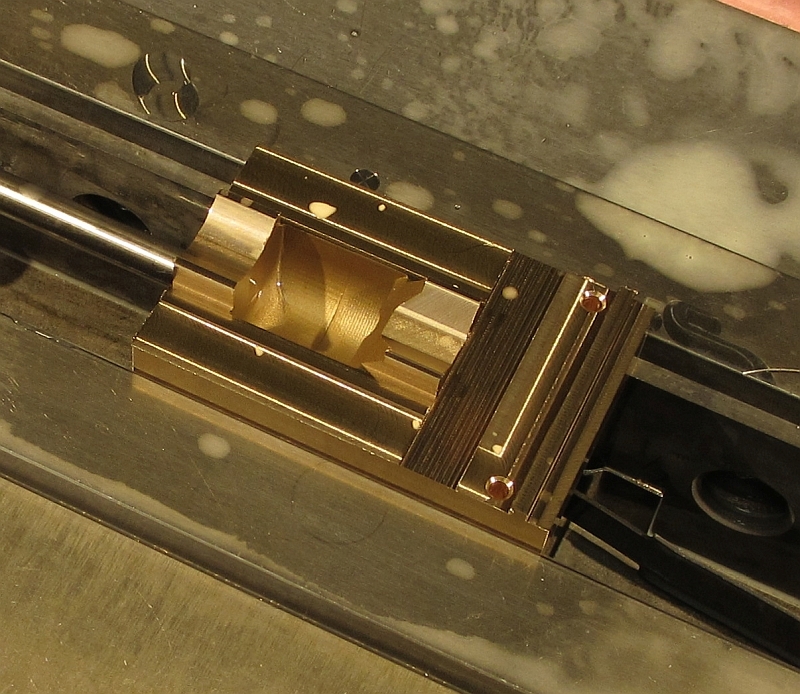 The next operation was to mill the hex for the vise handle. 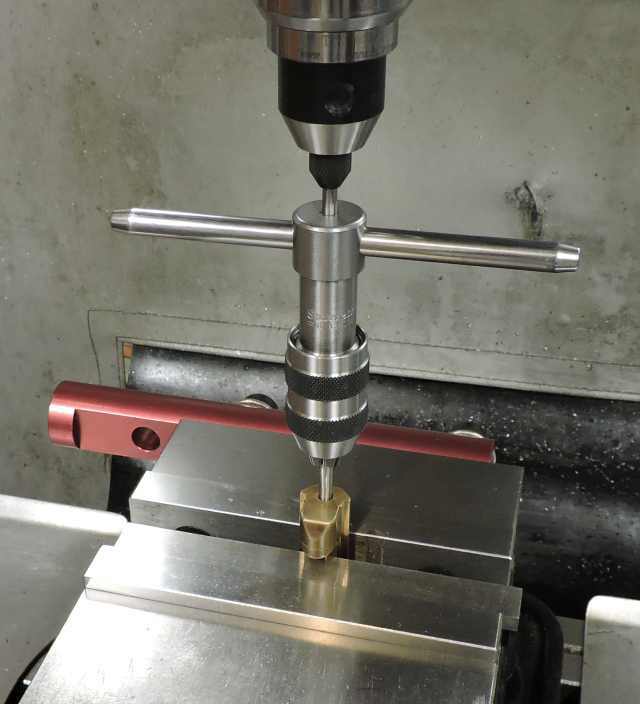 I used a collet fixture and had the screw standing vertically, then the CNC was use to drive the cutter around the part. 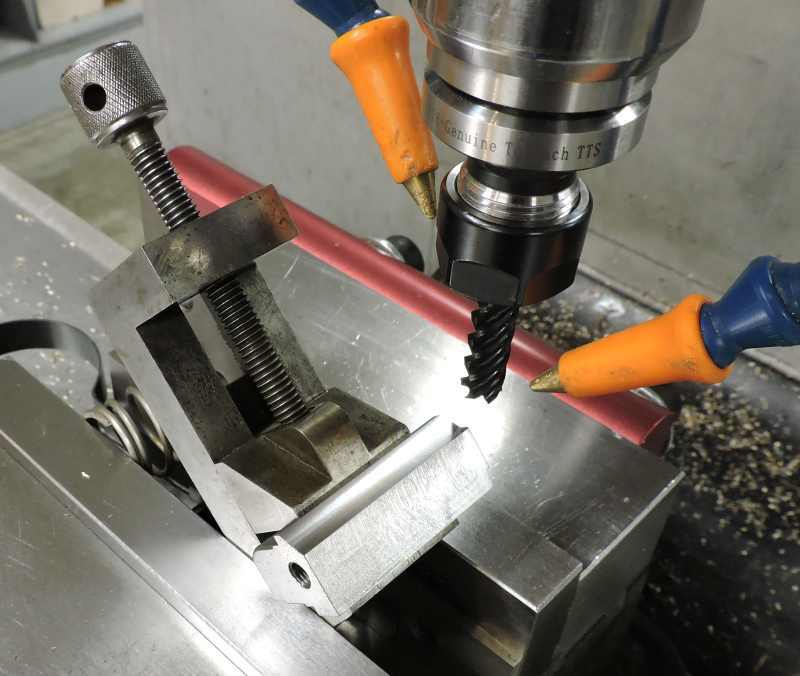 The last operation for the screws was to machine away the excess material. 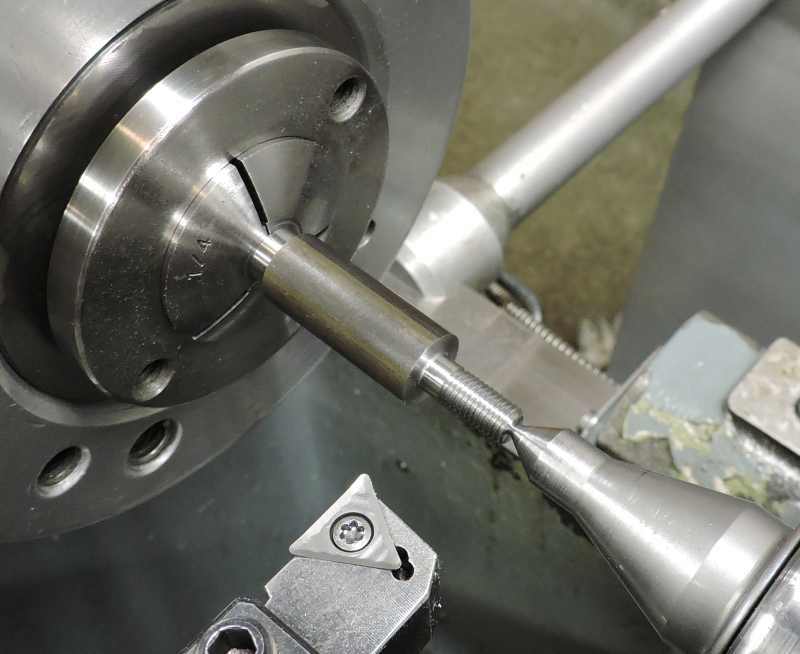 The stock is removed creating a relief behind the threads for the nut. Early on Roland and I both searched for a proper thrust bearing for the vise and neither one of us were able to come up with anything small enough. So I decided to see if I could make on that would work. There wasn’t much real estate to work with in this area; the 1.5mm balls were chosen because they were readily available and would fit in the space. Here the ball cage has been drilled in the mill, and now in the lathe it is turned, bored and parted off. 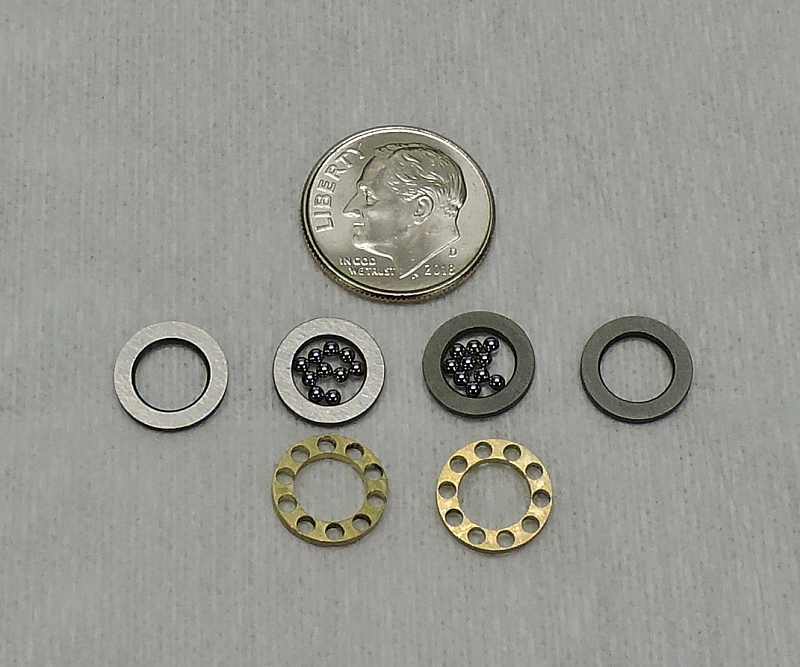 Here is a family shot of two bearing assemblies. 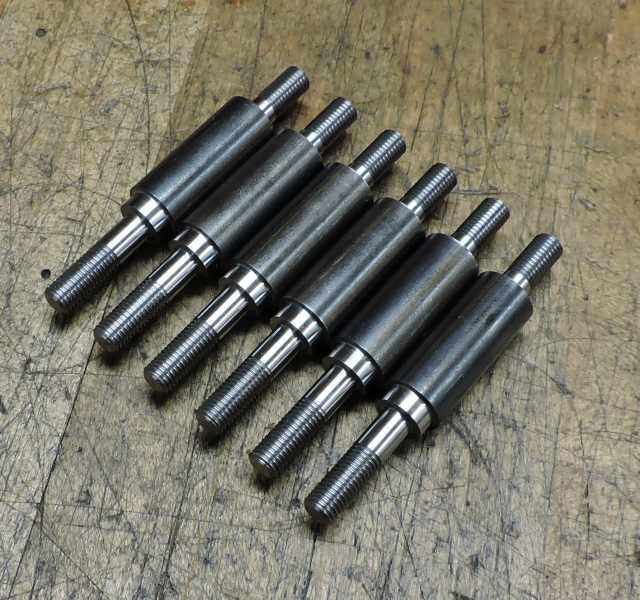 The bearing races were machined form O1 tool steel, hardened and ground. 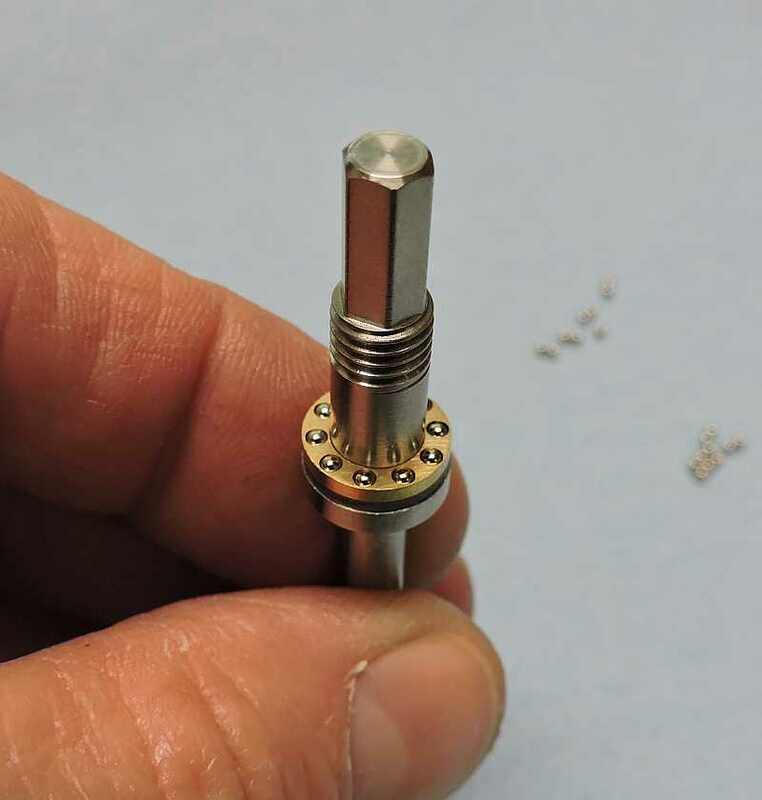 The thrust bearing is assembled on the screw and packed with grease on final assembly. 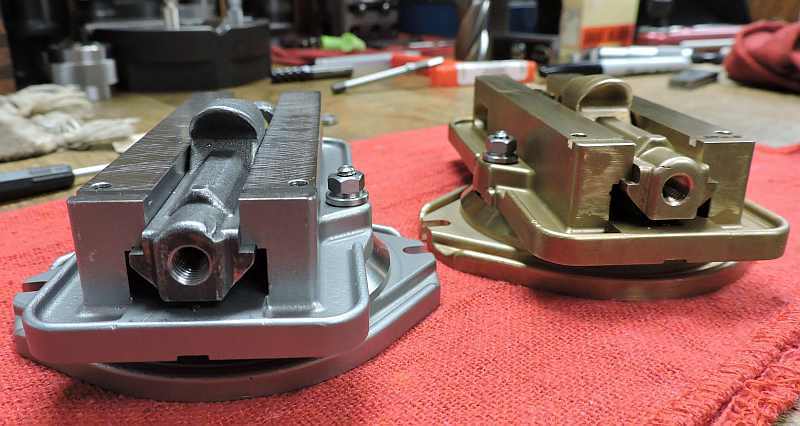 Here are a couple shots showing how the nuts fit into the vise bodies. Excellent sequences and explanations Dave!! Beautiful work Dave. Those look fantastic!! Wow. The works is just awesome. Really makes me feel inadequate...but some day...some day! You would never think these are scaled down versions by looking at the details. Nice job on those thrust bearings! Thanks for all the nice comments guys, they are appreciated. As I told Zee: trying to catch up. Dude, if you ever decide to give up the machining trade; you could go into the presentation of products business. The work is awesome as always, the pictures are crisp and clear, and the narrative is spot on. I have refrained, but, guess I need to get my order in and put them in the aging area with the machinist vice . Just damn nice work Dave. The new DX6's are out now Dave. I will have to look but I think there is a DX4 as well. Just checked, there is a DX4 but it's only 40.00 less than the DX6 if you can handle the larger size now weighing in at 65 lbs. I appreciate the nice comments, and that you take time from your busy day to look at my projects. I think the castings are still out a ways so you have some time to ponder it. 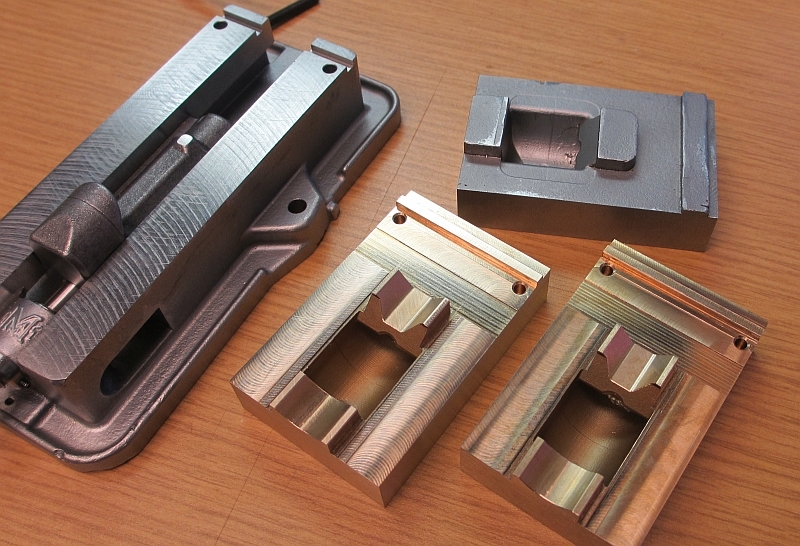 Work continues on the Mill vise project and the next item/s in line are the jaws. The moveable and stationary jaws are cast in one piece. 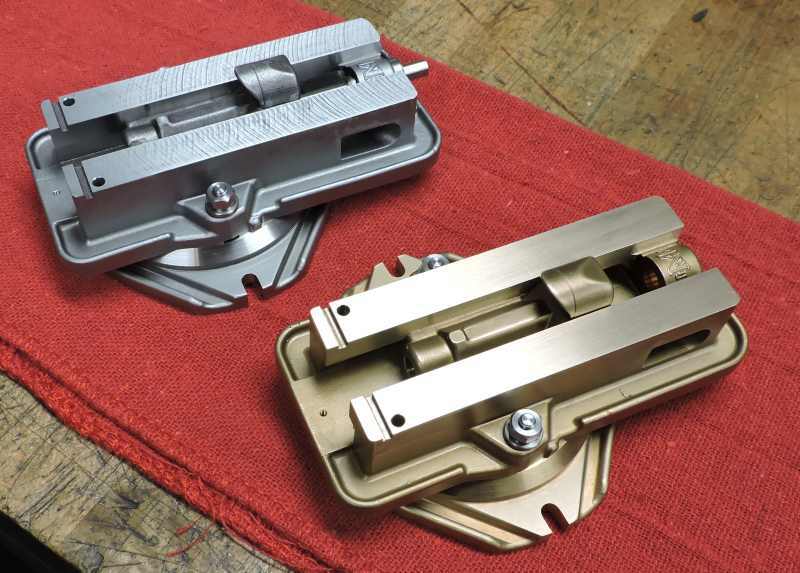 They could be cut in two and machined separately but what fun would that be? I decided to go ahead and do as much work as possible with them attached to each other. The only part of the casting that doesn’t get any machining is the internal cavity where the nut fits. 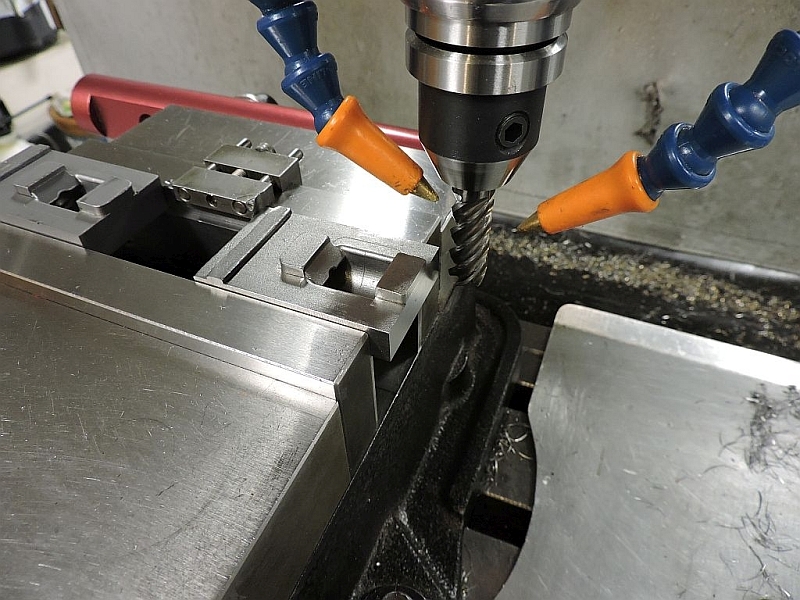 Keeping this in mind it is important to keep this feature reasonably square with the machined surfaces of the jaw. Starting out the top surface was skimmed just enough to clean it up. Here the jaw casting is set up and the cavity indicated in; after which the up facing surface gets a light skim to clean it up. 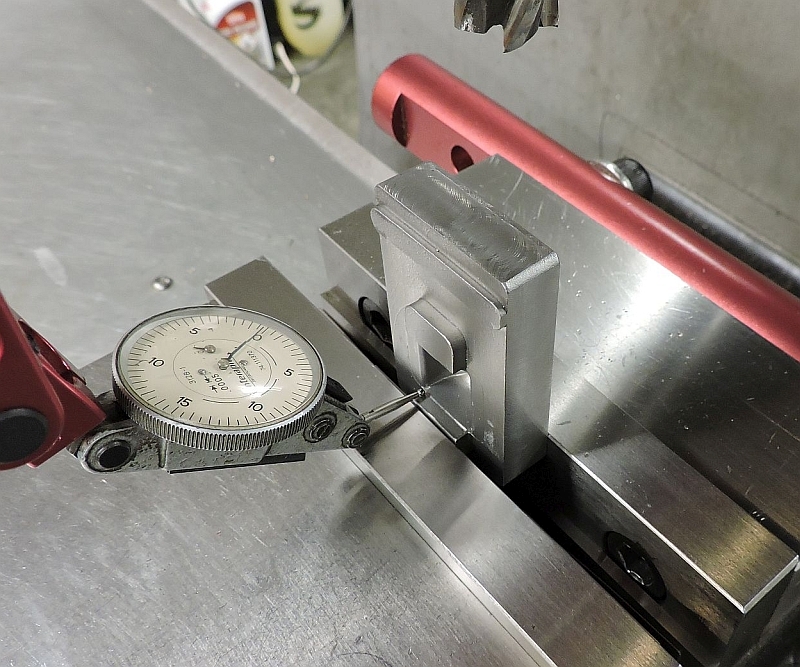 Once the end was square with the cavity the sides could be machined; here the casting is set up in the mill vise and squared up using the previously machined surface. Both sides were skimmed just enough to clean up the surface. 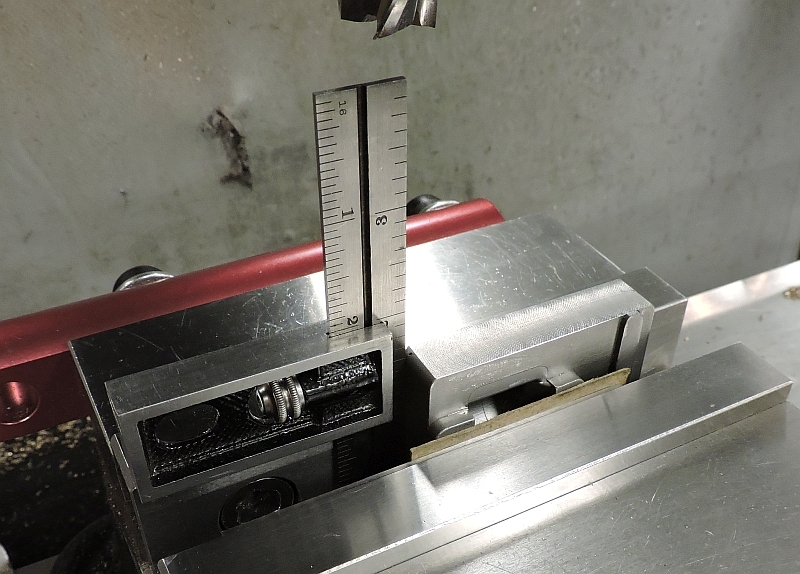 I messed around with some different ways to measure the cavity to edge dimension. 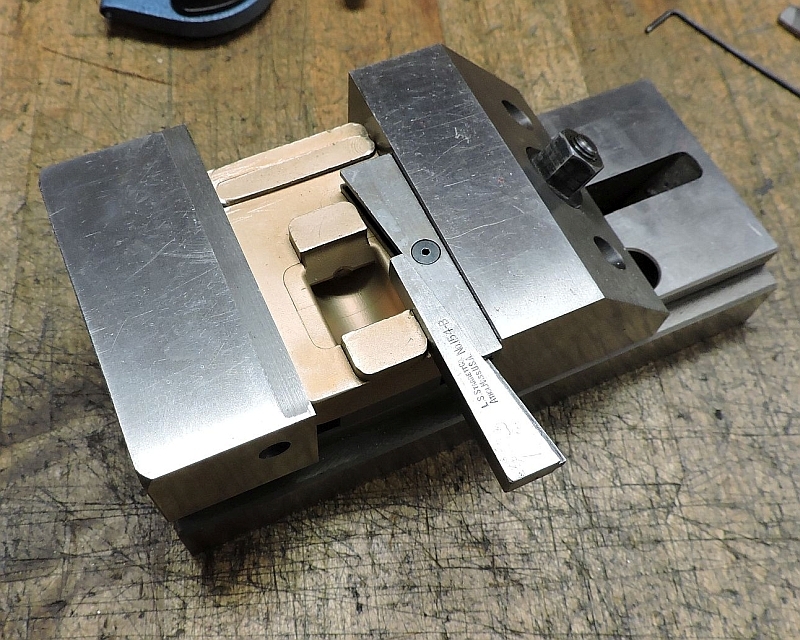 Putting the casting in a precision vise and using an adjustable parallel seemed to give me good repeatable readings. 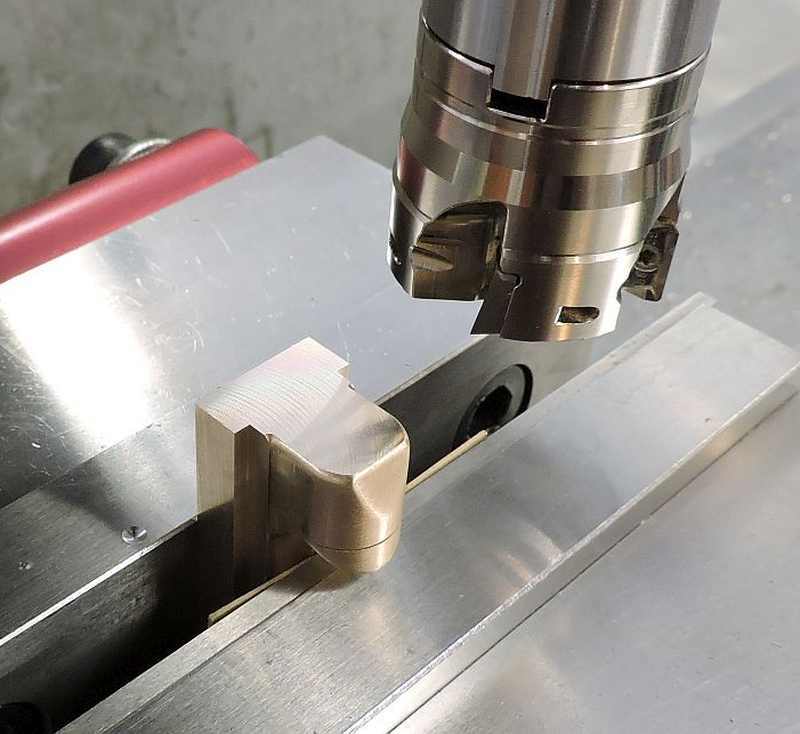 The idea here was to determine how much more material to remove from each side to bring the part to final width and have the cavity centered. 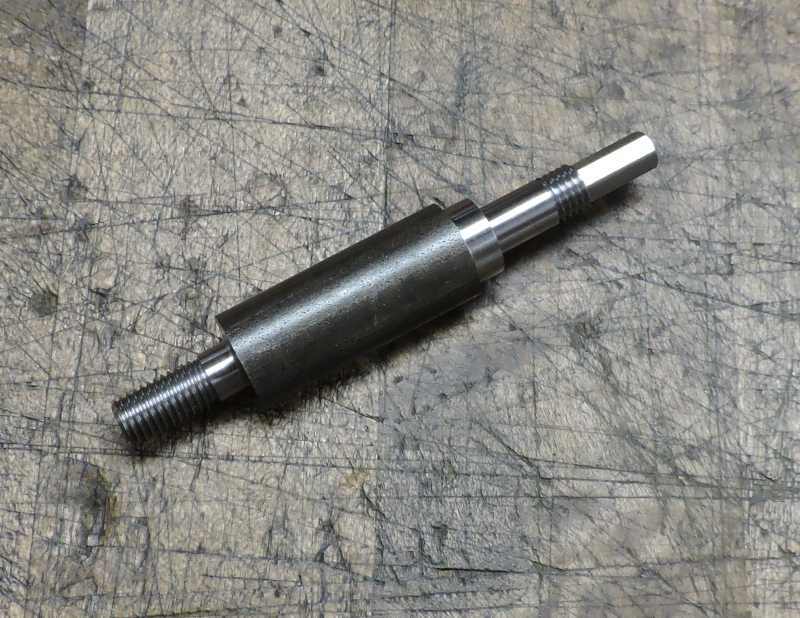 After the jaw was machined to the proper width the ends could be machined to bring the length to the proper dimension. After the jaw casting was brought to size the rest of the features could be machined. A program was created that covered all these features in one operation. 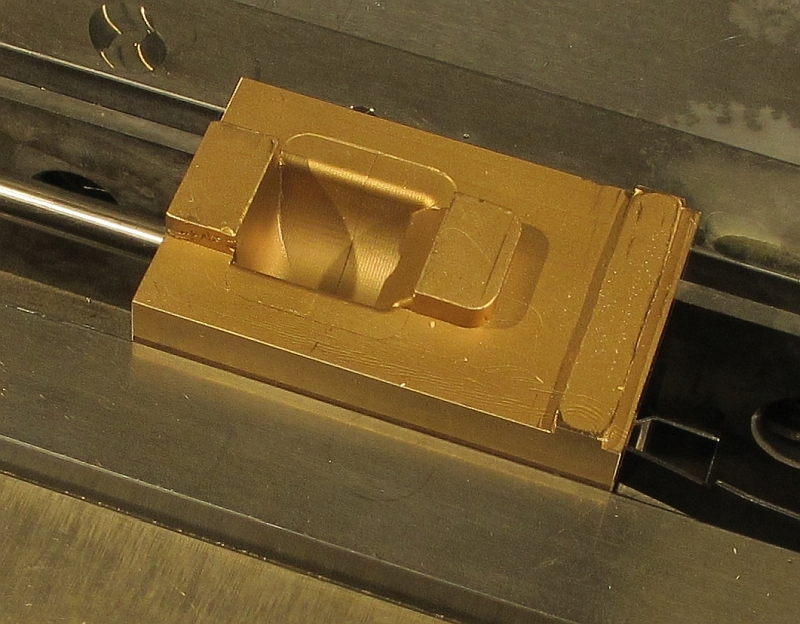 Here is one of the bronze castings in the vise ready to go. 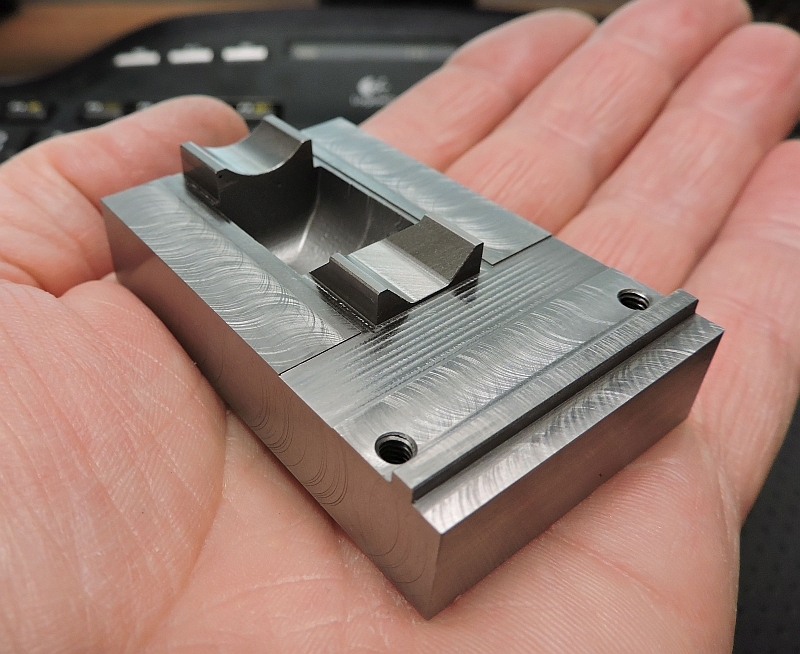 Here it is after machining; the blind 5-40 screw holes will be tapped off line. Here is one of the steel jaw castings after machining the bottom. 3d tool paths were used to machine the arc and V in the center. You can see the area between the two jaws where there is plenty of room to saw them in two. We have a water cooled abrasive saw in the shop at work; that is what I used to cut them in two. Some Kurt vises use a separate key to locate and align the stationary jaw and some have the key as an integral part of the jaw. 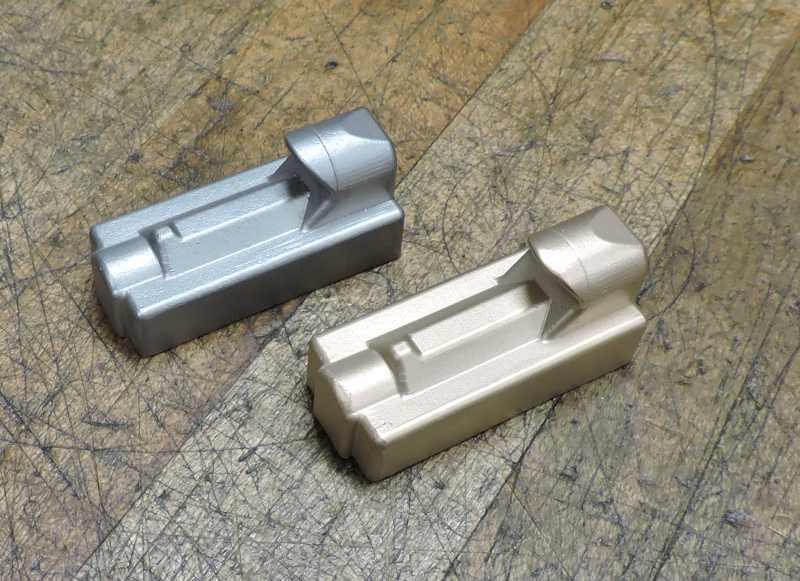 When Marvin made the molds, he allowed for the jaw key to be machined as part of the jaw; so that is the way I decided to go. Here is group shot showing before and after. 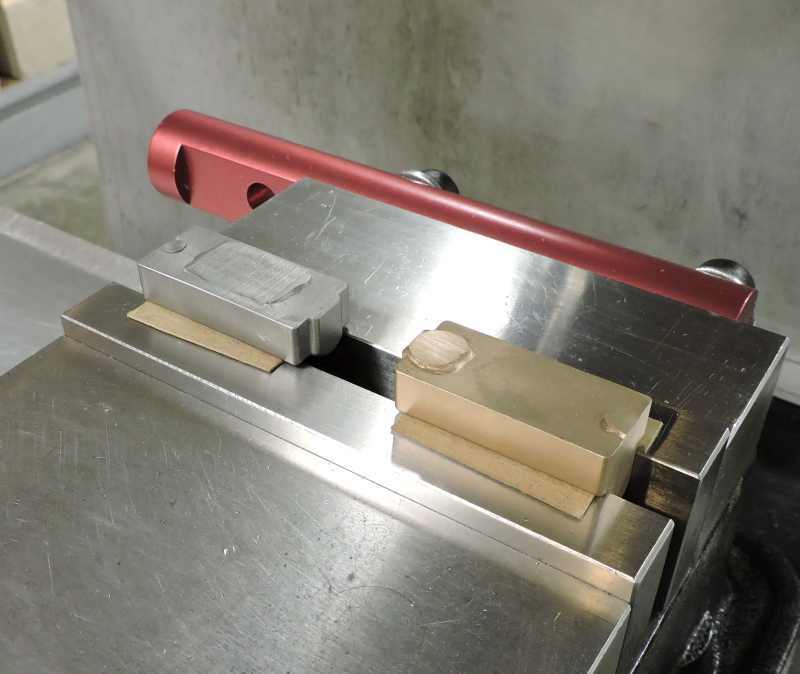 Care was exercised to insure a proper sliding fit between the moveable jaw and the vise body. After the jaws were separated they were machined to final dimension and the holes for the jaw plates drilled and tapped. Moveable jaw shown here. The center hole is where the dog point set screw goes that locks the jaw into the nut and is also used to adjust the backlash of the jaw. And here is the stationary jaw. 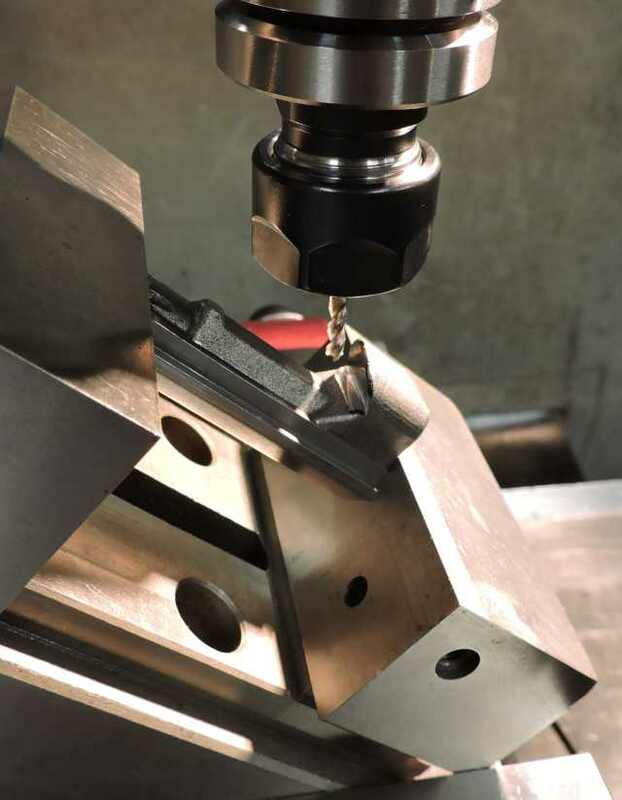 After the jaws are assembled on the vise body the top surface is machined to final thickness. More to follow and thanks for checking in. You just always do impressive work, don't you, Dave? Just love seeing your work. Bad Behavior has blocked 15665 access attempts in the last 7 days.